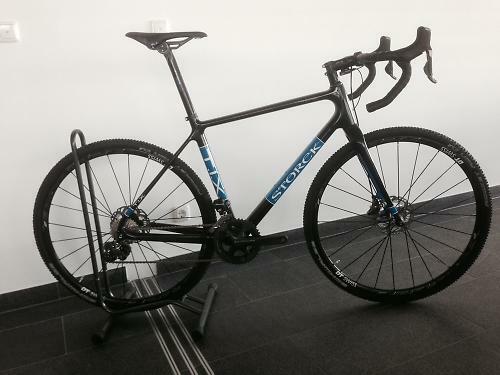 road.cc can exclusively reveal that German bike brand Storck will be releasing its first ever cyclocross frame, the TIX, later this year. We’ll be giving you a worldwide exclusive ride report on it, hopefully in the next couple of weeks. What do you make of that, huh? Exciting. TIX stands for This Is Cross (kind of), although it’s actually given as This Is Xross on Storck’s website. No details of the bike other than the name are the site yet. A bit more detective work (Google’s amazing, innit?) reveals a Storck 2014 price list with the frame and fork listed at £1,749 and a complete bike with Dura-Ace Di2 at £4,999. Call it five grand, shall we? And that’s yer lot as far as existing information about the TIX is concerned. Until now. We’ve got our grubby little mitts on a couple of sneaky spy shots. What do they reveal? Well, it’s a full-carbon frameset with thru-axles (rather than standard dropouts) front and rear. Thru axles have been a feature in mountain biking for years and a few brands (not many) have used them to handle the forces associated with disc brakes on disc brake road bikes. Who knows whether that’s the way the market will develop over the next few years? As is always the case with Storck, most of the frame tubes look pretty chunky. Storck are big on stiffness-to-weight. You might even call it an obsession. That said, those tubes aren’t ridiculously chunky. The down tube looks meaty but it’s no scaffold pole. The seatstays, on the other hand, look really slim. We’d speculate that the idea there is to provide a bit of give at the back end to help take the sting out of rough surfaces and keep the bike in contact with the ground. That’s usually the rationale. It looks like the top tube slopes down more steeply that on any of Storck’s road bikes too, leaving more seatpost extending out of the frame with the potential to flex and add more comfort to the ride. Again, that’s guesswork. We’ll also hazard a guess that the TIX is built with ‘proportional tubing’ because that’s a feature of all of Storck’s existing carbon bikes. They vary the wall thickness, outer dimensions and butting according to frame size so that they all ride the same (or at least very similar). Don’t read too much into the components, by the way. The bikes are built up completely different to one another (one is SRAM, one is Shimano) aside from Storck’s own handlebar, stem and seatpost and the Selle Italia SLR saddle. For more information go to www.storck-bicycle.cc. Well, that’s for more information on Storck. You won’t find any more information on the TIX because there isn’t any there yet. On the other hand, if you check in to road.cc regularly next week you might see a few more pictures because we expecting a delivery. Leave it around the back if we’re not in. Cheers.